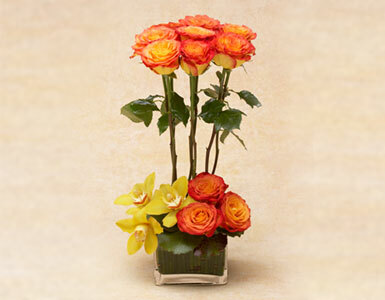 A tall bunch of roses accented with a base of roses and Cymbidium orchids. We create beautiful arrangements of anniversary flowers, birthday flowers, and get well flowers including two-toned rose arrangements. We promptly deliver your rose arrangements and mixed rose gifts to your home or office in Beverly Hills, West Hollywood, Santa Monica, and greater Los Angeles area.